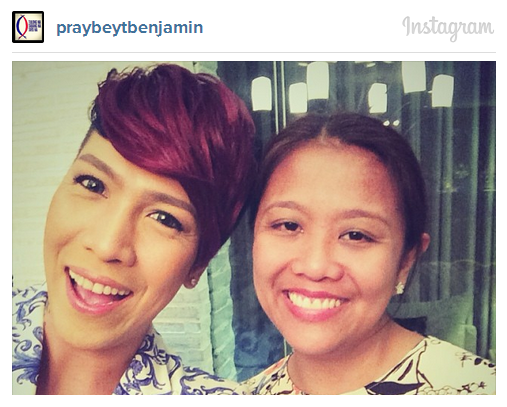 March 25, 2014; Host-actor Vice Ganda and Senator Nancy Binay seen together on hosted birthday dinner by their common friend named Bernard Cloma as Kris Aquino revealed during live of her show "Aquino and Abunda Tonight". The viral issues on both personalities takes place last year after the 2013 mid-term elections. It was dated May 2013 when Vice Ganda publicly criticized Nancy Binay by saying he was not impressed with the track record or the lack of political background then she run for senatorial candidate immediately. Vica Ganda's comment triggered during "It's Showtime" episode when he was asked about pursuing a career in public service. He mentioned the name of Vice President Jejomar Binay's daughter (Nancy Binay) and criticized its eligibility to be a future senator that concluded by netizens that helps Binay winning the election due to popularity related to this issue. Nancy Binay responded on Vice Ganda's comment and enumerates her experiences; as she works as "on-the-job training" under her parents for ten years, as she worked as her father's personal assistant, and as deputy secretary general of the United Nationalist Alliance. As of 2013 election ended, Binay wins as one of the 24 incumbent senators of the 16th Congress. This news published on ABS-CBN news only shows that Host-actor Vice Ganda and Senator Nancy Binay already moved on on their past issues.